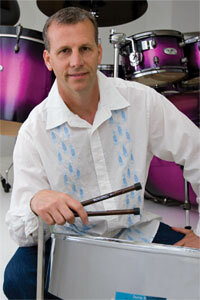 Mat Britain has pursued his love of percussion from the plains of Kansas to the island of Trinidad. He has traveled numerous times to Trinidad and performed with the Amoco Renegades Steel Band at the prestigious Panorama Festival. Living in Nashville, Tennessee, he directs the Vanderbilt University Steel Drum Band program and leads his professional steel band "Deep Grooves". His recorded efforts include the steel drum solos on the quadruple platinum hits "When The Sun Goes Down" and "Shift Work" by mega-star Kenny Chesney as well as recent Chesney CD releases "Just Who I Am; Poets & Pirates", "Be As You Are" (Songs from an Old Blue Chair), and "The Road & the Radio". You can also catch some of Mat's music on numerous TV and radio jingles, episodes of "Live with Regis & Kelly", and if you are up really late at night, re-runs of "Lifestyles of the Rich & Famous". Mat has shared the stage and/or recording studio with music industry veterans such as Grammy Award winning artists Lee Greenwood, Neal McCoy, Charlie Pride, and Louise Mandrell, as well as Nashville's newest stars the Warren Brothers, Rebecca Lynn Howard and Steve Azar. Mat has the musical distinction of being the first percussionist to grace the famous Grand '01 Opry stage with Latin percussion instruments such as congas, bongos, and timbales. He can also be found touring the country with the Britain/Moore Duo, a unique and creative percussion collaboration with long time friend and Marimba master Dan Moore. Mat is indeed an All-American percussionist with a global perspective that permeates his grooves, style, and musicianship. He is a proud endorser and clinician for; Pearl Percussion, Zildjian Cymbals, Innovative Percussion mallets and sticks, and XL "Protector" cases. Kenny Chesney- "When The Sun Goes Down"
Kenny Chesney- "Just Who I Am; Poets & Pirates"
Kenny Chesney- "The Road & The Radio"
Neal McCoy- "That's Life" Duet with Charlie Pride- "You're My Jamaica"
Lee Greenwood- "Stronger Than Time"
Lee Greenwood- "All-Time Greatest Hits"
Britain/Moore Duo- "Little World of Rhythm"
Green Hills Music- "Caribbean Summer"
"Live with Regis & Kelly"